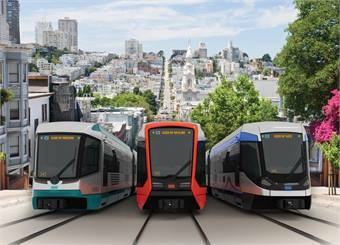 San Francisco's Municipal Transportation Agency (SFMTA) awarded Siemens a $648 million contract to deliver an initial 175 light railcars for its Muni transit system. With an option for an additional 85 cars, this is one of the biggest orders for light railcars ever placed in the U.S. The trains will be built at the Siemens plant in Sacramento, Calif., with the first cars set to be delivered at the end of 2016. Siemens will deliver a newly-developed light railcar based on its Model S200 for the San Francisco order. The car is especially energy-efficient thanks to a light-weight drive system that recuperates braking energy and an LED lighting system that uses up to 40% less electricity than standard neon lighting. The light railcars will be built according to the Buy America rules at the Siemens plant in Sacramento. Around 80% of the electricity used by the plant for manufacturing is generated by a two-megawatt photovoltaic installation on the building's roof. The solar units reduce the facility's carbon dioxide emissions by around 1,470 tons a year.